French fashion house Balenciaga is being sued for creating key rings that closely resemble Little Trees, the popular in-car air fresheners. Car-Freshner Corporation, which has owned the rights to Little Trees fresheners since 1952, has filed a lawsuit in a New York federal court against the fashion brand for copyright. It claims that customers may confuse its product, which typically hangs from the rear-view mirrors of cars, with the key ring Balenciaga is selling for $275 (£175). The legal document alleges that "Balenciaga was not only aware of Plaintiffs' famous Tree Design Marks prior to its manufacture and distribution of the infringing products, but deliberately based its design on" the products. The leather keyring has been on sale online, at Balenciaga's New York store and at Neiman Marcus, a department store in the city, since last month. It is available in shades of pink, blue and green, identical to those of the Little Tree freshener – a factor cited in the case. 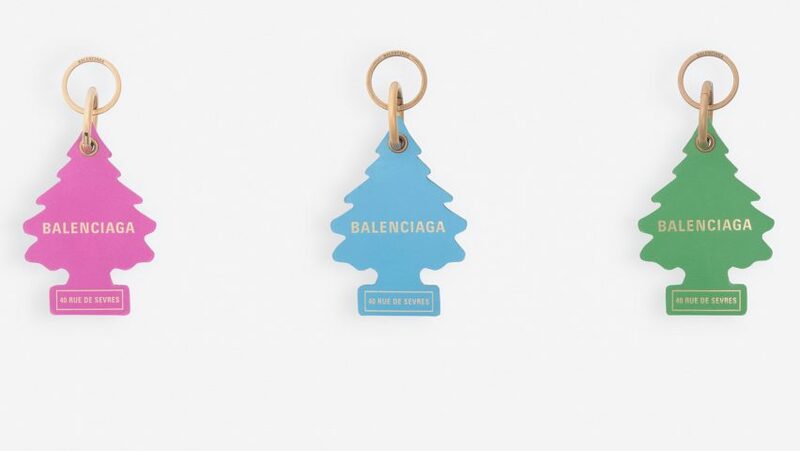 "Balenciaga has even copied the specific colours associated with some of the popular scents in which the plaintiffs' Little Trees Air Fresheners are offered," it states. Many companies have previously sought permission to use the tree silhouette, including Kia Motors and Capital One, which were granted licenses to use the distinctive shape. Given that Balenciaga didn't seek permission, Little Trees has asked to receive profits from the sale of the keyring. The fashion house led by street-style designer Demna Gvasalia has form when it comes to replicating well-known designs. Last year it put up for sale blue tote bags that closely resembled IKEA's Frakta shopping bags, at the cost of £1,075, to IKEA's 40p.